Developers Dream! 12+ ac zoned for RTH 4 TH per upland acre. Includes permitting for dredging and 20+ docks on canal to head out to gulf. COMBINED Parcels DISCOUNTED $775,000. Other parcel zoned C2 commercial with building previously used as restaurant. $175,000 SEPARATELY. 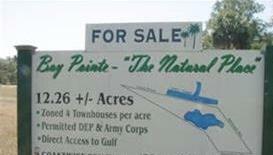 Last large parcel in Shell Point! INVESTORS, DEVELOPERS, BUILDERS, perfect location for Townhouses, Senior Living or Upscale motor homes with water access and near beach. WANT A FAMILY COMPOUND....look no further! So many possibilities! Buy both parcels at discounted price $775,000. PERFECT FOR VACATION HOMES OR YEAR ROUND LIVING.